I never really thought I would be interested in Superheroes. I have been proven wrong. Kidlet and I went to see The Avengers over the weekend. OMG. So good. Now we're working our way through the previous movies like IronMan and Hulk. SO GOOD. I was going to make this bento last week but Star Wars day got in the way. 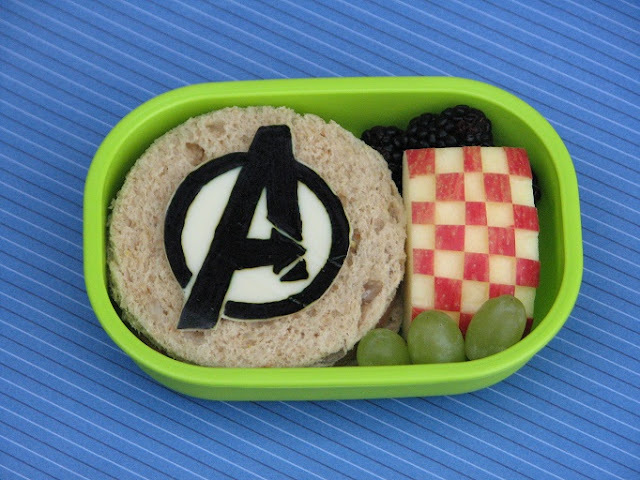 This is the first of probably many superhero lunches. Kidlet has the Avengers logo of cheese with food color on a soy ham sandwich. On the side are blackberries, checkered apple, and grapes. How did you make the checked apple and the logo? I'm new to this so i have no clue where to start. The checkered apple is made by scoring an apple slice with vertical and horizontal lines and then removing the skin in alternating squares.